SAN JOSE, Calif.—Dec. 6, 2018—Designers of small, battery-powered electronics can enhance the user experience by extending battery life and further shrinking device size with six new low-power power-management integrated circuits (PMICs) from Maxim Integrated Products, Inc. (NASDAQ: MXIM). 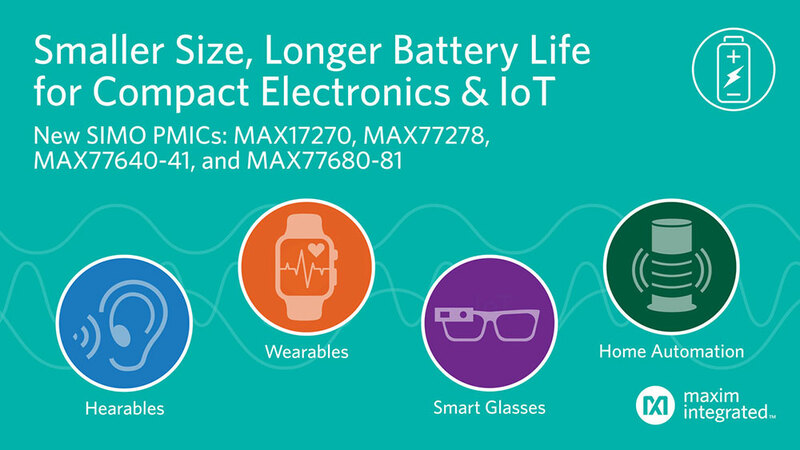 The MAX17270, MAX77278, MAX77640/MAX77641 and MAX77680/MAX77681 PMICs help to reduce the power-management footprint by up to 50 percent for space-constrained products such as wearables, hearables, sensors, smart-home automation hubs and internet of things (IoT) devices. They increase the overall system efficiency by nine percent compared to the closest competitive solution, while also reducing heat dissipation, an important consideration for wearable products that make skin contact. Designers are striving to make electronic gadgets more integral in consumers’ lives by scaling down their form factor, reducing heat, improving efficiency and extending battery life. Meeting each of these criteria is a formidable challenge given the rich feature sets, lower thermal thresholds and smaller capacity batteries required to achieve increasingly compact solution sizes. Maxim is expanding its portfolio of SIMO PMICs to enable designers to overcome these challenges, continuing the compact size and efficiency precedents set by MAX77650/MAX77651. The unique control architecture in the MAX17270, MAX77278, MAX77640/MAX77641 and MAX77680/MAX77681 PMICs allows a single inductor to serve as the critical energy-storage element for multiple, independent DC-rail outputs. This allows engineers to reduce the number of bulky inductors in their designs, thereby improving efficiency, shrinking form factor and reducing heat dissipation. In addition, the low quiescent current of the PMICs plays an important role in extending battery life. With the intrinsic buck-boost operation of the PMICs, the power rails can operate over a battery’s entire range. The MAX17270EVKIT# evaluation kit is available for $100; the MAX77278EVKIT# evaluation kit is available for $100; the MAX77680/MAX77681EVKIT#evaluation kit is available for $100; and the MAX77640/MAX77641EVKIT# is available for $100.